This DTC is output when the ECM detects errors in communication between the transponder key ECU and the ECM, or in the communication lines. 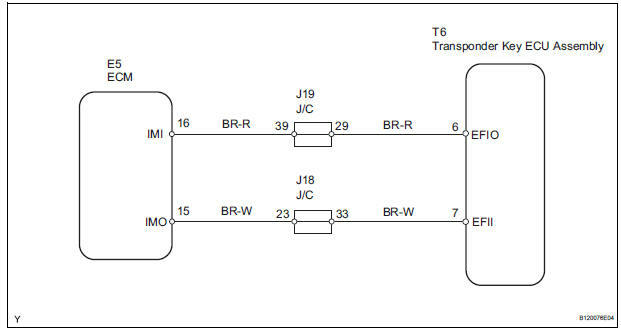 This DTC is also output when an engine start is attempted while the ECU communication ID between the transponder key ECU and the ECM are different. 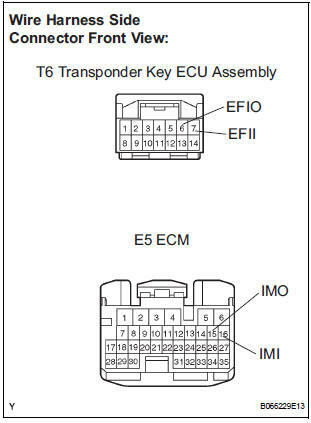 Before troubleshooting for this DTC, make sure that there is no DTC detected in the transponder key ECU. If there is key code-related DTC detected in the transponder key ECU, repair it first. Disconnect the T6 ECU and E5 ECM connectors. Check the resistance of the wire harness side connectors. After replacing the transponder key ECU assembly with a normally functioning transponder key ECU assembly, check that the engine starts.